The censorship itself, that's not the worst evil. The worst evil is — and that's the product of censorship — is the self-censorship, because that twists spines, that destroys my character because I have to think something else and say something else, I have to always control myself. 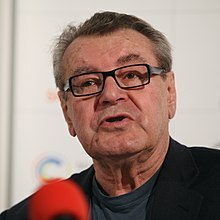 Jan Tomáš Forman (February 18, 1932 - April 13, 2018), most famous as Miloš Forman, is a Czech-American film director, screenwriter, actor, professorand and an emigrant from Czechoslovakia. Two of his films, One Flew Over the Cuckoo's Nest and Amadeus, are among the most celebrated in the history of film, both garnering him the Academy Award as a director. He was also nominated for The People vs. Larry Flynt. So everybody joined. And everything is controlled and everybody is a member of some committee, because then their watchdogs placed in the committees can control everything, what this person says or how this person think, you know. It was... it was just ridiculous. All the Sixties were complicated, you know. On the one hand it was funny too, you know; on the other hand it was cruel, you know. The communists are so cruel, because they impose one taste on everybody, on everything, and who doesn't comply with their teachings and with their ideology, is very soon labeled pervert, you know, or whatever they want you call it, or counterrevolutionary or whatever. And then the censorship itself, that's not the worst evil. The worst evil is — and that's the product of censorship — is the self-censorship, because that twists spines, that destroys my character because I have to think something else and say something else, I have to always control myself. I am stopping to being honest, I am becoming hypocrite — and that's what they wanted, they wanted everybody to feel guilty, they were, you know... And also they were absolutely brilliant in one way, you know: they knew how effective is not to punish somebody who is guilty; what Communist Party members could afford to do was mind-boggling: they could do practically anything they wanted — steal, you know, lie, whatever. What was important — that they punished if you're innocent, because that puts everybody, you know, puts fear in everybody. First of all, whoever didn't want to be a member of this association or the other association, was branded, you know, like a dangerous individualist, you know, infected by the Western decadence, you know. So everybody joined. And everything is controlled and everybody is a member of some committee, because then their watchdogs placed in the committees can control everything, what this person says or how this person think, you know. It was... [Sighs] it was just ridiculous. You know, you have to really decide where you want to live: if you want to live in the jungle or in the zoo. Because if you want the beauty, if you want freedom, the jungle is... that's your world. But you're in danger there, you have to live with snakes, sharks, tigers, skunks, you know, mosquitoes, leeches. You want to be safe, you have to live in the zoo. You are protected. You know, if you are a lamb, the tiger will not attack you. You know, you'll get a little bit something to eat every day; that's fine. You have to work hard, but you live behind the bars, and what's wonderful — you live there behind the bars and you dream about the beauty of the jungle. Now what happened was that the bars opened, and everybody runs after the dream. And suddenly, well, yeah, it's beautiful — yes, I am free to go wherever I want, do whatever I want, but where do I want to go? Oh, my God, and here is a tiger and here's a snake. Oh, oh, and people have a tendency to, you know, back. And you will be surprised how many people prefer to live in the zoo; they are not ready to pay for the freedom; they think that freedom should be, you know, for free, even for granted, which never is, never is. I tell you, in my opinion, the cornerstone of democracy is free press — that's the cornerstone. I'm convinced if the press... it was not possible, of course, but if the free press existed through this century, there wouldn't be Hitler there wouldn't Stalin, there wouldn't be all this incredible price people have to pay for their freedom, you know, because that's what they're always first after… newspapers, radio, television, everything like that. This page was last edited on 27 January 2019, at 13:07.